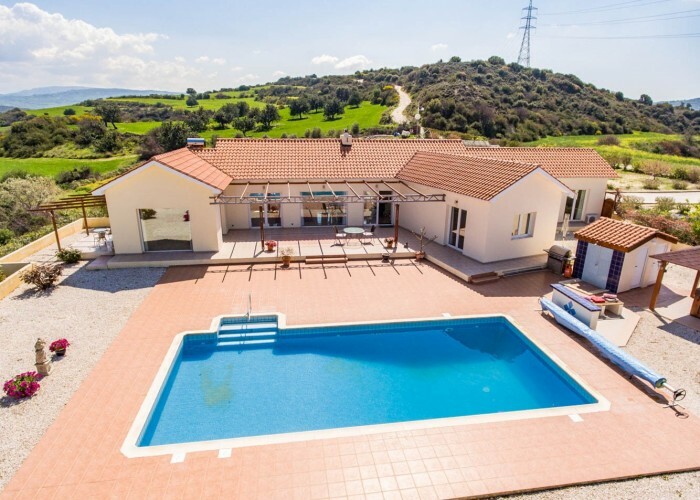 A magnificent country estate near Polis, Paphos.. 4 bedroom 4 bathroom bungalow on 12,000 metres. Stunning views over the Cyprus countryside. . This magnificent bungalow is situated on a large plot of land with stunning uninterrupted views. 10 minutes from the beach. This property has been finished to the highest possible standard and has every possible extra. It is also ‘eco friendly having no electricity supply!! All power to the property and the heated pool is generated via solar panels. The property is one mile from the local village of Skouli and in a very quiet location, however the town of Polis is only 10 minutes away and the Marina and beaches of Latchi are a 15 minute drive. Paphos is a 25 minute drive. This is a large plot suitable for a variety of purposes including a horse ranch. At present the property is surrounded by landscaped gardens. The property itself is a modern design with plenty of space and benefits from double glazing and a high level of insulation making the house cool in summer and warm in winter. The front door leads into the spacious open plan lounge with large patio doors leading onto the terrace and the swimming pool. Adjoining the lounge is the very modern Italian kitchen with an island cooking area as well as separate areas for food preparation and drink supplies. In the Centre of the lounge is an attractive pellet burning stove, which easily heats the whole bungalow in the cooler winter nights. The house has an unusual layout of the 4 double bedrooms, in that they are all ensuite and each bedroom has its own individual terrace and arranged so that each one has total privacy. The house is finished to an exceptionally high standard and has every conceivable extra. It has full village water supply including a pressure pump. Outside is a large terraced area surrounding the 11 x 5 swimming pool which is heated for all year around use. The gardens are landscaped to a high standard with a wide range of trees and a summer house currently under construction. There are outside storage sheds as well as garage parking for 3 cars. Plans have been drawn up for 2 log homes to be built in the grounds for visiting guests. This is an exceptional property with an eco pellet fireplace and is ideal for the discerning buyer looking for a large property with privacy and stunning views.